When the sun sinks in the west on Thursday evenings is the time Oliver’s musicians and artists are set to entertain all summer long. 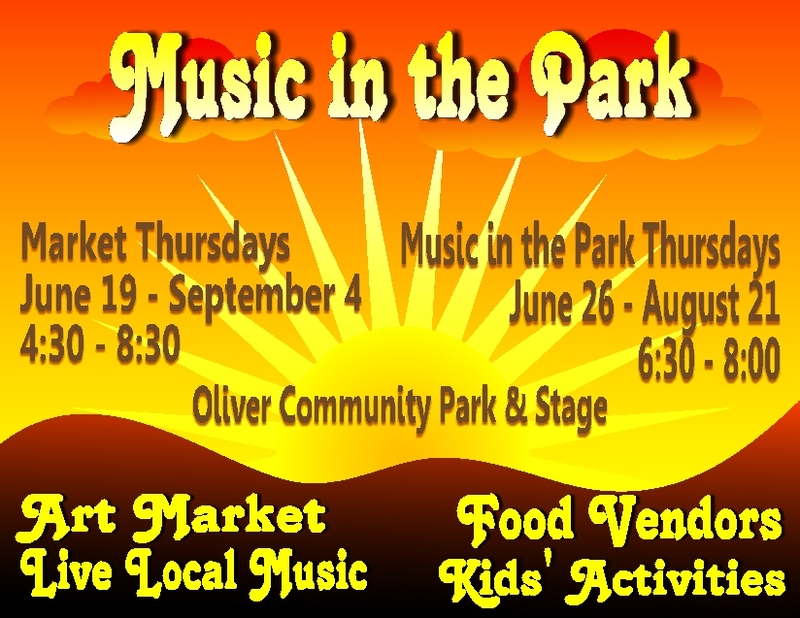 A vibrant market and concert series at the Oliver Community Park is the result of a new collaboration between Oliver Parks and Recreation and the Oliver Community Arts Council. Starting Thursday June 19, Oliver Parks and Recreation hosts a weekly artisan market in the community park from 4:30 – 8:30 p.m. The festival kicks into high gear the following Thursday when Music in the Park moves from the historic CPR Station to the Community Stage bandshell for all its performances. The Penticton Concert Band opens the series on Thursday June 26, from 6:30 – 8:00 p.m.
Sheridan is responsible for the food vendors and art market portion of the weekly festival. She is still accepting vendor applications and extends an invitation to those who wish to promote their art, artisan products, fresh produce, baked goods, preserves or merchandise. “To ensure a success, we’re making this really affordable for vendors.” Food vendors will be charged $30 per night and will be limited to three food vendors per market. Other market vendors will be charged $15 per market, or are encouraged to join the Oliver Arts Council to receive a discounted price of $10 per market. Information booths are welcome and are free, but still require an application. “Together, we’re offering a complete entertainment package at sunset every Thursday in the park,” says Penelope Johnson, arts council president. The art market promises to be a creative place for locals and tourists to shop. Food vendors on site will encourage shoppers to linger until the 6:30 p.m. concert time, with supper picnicking in the park. Children’s activities such as face painting, games, and arts and crafts will be available at most markets. Musical performances will span the genres from country to classic rock to jazz to indie and world beat. To wind down the evening, the market and food vendors will remain open an extra half hour to 8:30 p.m.
Music in the Park continues as admission by donation. The lineup includes the Penticton Concert Band, Nankama Drum and Dance, Aidan Hayes and Mandy Cole, Steve Jones and the Patio Bandits, Divas Night, Nashville singer Andi Zack, Rising Stars Night, and concludes with Jazz Out West on Thursday August 21. Oliver Parks and Recreation will host a couple of special ticketed concerts: Brickhouse on July 10 to kick off the Sunshine Festival weekend and a Mexican Fiesta to close out the season on September 4. Special note: Also on Thursdays beginning June 19, the Oliver Country Market A-Fair starts the day off right with wholesome produce available in Lions Park from 8:00 am to 1:00 pm until late September.